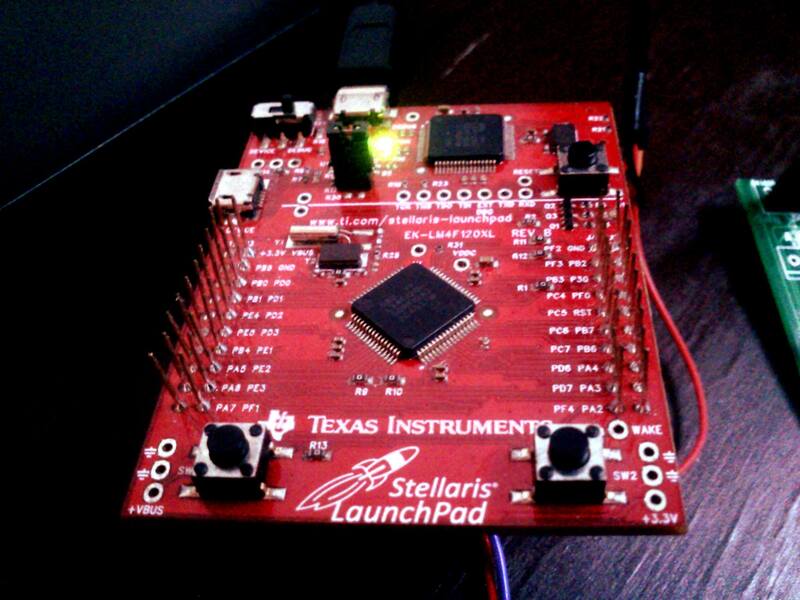 Last year I ordered a Stellaris Launchpad Evaluation Board from Texas Instruments for $12.99. It arrived through FedEx in 3-4 days (free shipping!). Update 1: They have changed the brand names from Stellaris to Tiva. Although the number of GPIO and other available pheripharels looks impressive, it should be noted that pinmuxing is used. In simple terms, same pin can be configured to use one of the available peripheral, therefore in practical terms you cannot use all SSI/SPI, I2C, UART, PWM ports at the same time. Word Of Caution: Note the copyright notice in the generated code, I think the best idea is to use the program to get an idea on pin config, but not using the C files directly in the code to reduce copyright troubles in case you are worried of the legal wording! 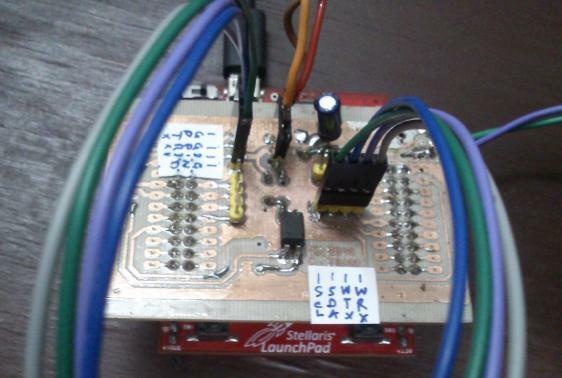 Similar to Arduino “Shields” there are “Booster packs” that can be plugged to the launchpad. Or you can design your own boosterpack like we did. Several options are offered for development, from Texas Instrument owned “Code Sourcery” to Arm’s Keil or GNU C compiler. I went for GNU C compiler based path. The ide used was eclipse, however other IDE’s can be used without a problem. The below link explain the method in detail. The Stellarisware/Tivaware library set gives high level functions to access and control the peripharels and others without referring the registers directly (these functions do it for you). This helps programmers who are used for encapsulated high level programming to start working on the device instead of bothering which register is used to do something. But knowing how the low level works is highly recommended to proceed in path of Arm or other embedded architectures. For me, working with this microcontroller through C helped to understand the somewhat confusing concept of “Pointers”. Also I practically used bit shifting and binary operations. The highlight of this architecture can be easily marked as the interrupts. The NVIC (Nested Vectored Interrupt Controller) enables the programmer to define the priority of different interrupts. For example, updating a display panel or responding to a polling query is low priority than dealing with an encoder. Also the large amount of available interrupts is quite useful on real time work since running everything on the while loop is not only inefficient, it cannot guarantee constant time between execution of each cycle of the loop. So do not use the infinite while loop for Control loops, instead use timed interrupts OR measure the time duration- this way is messy. I used these interrupts extensively in one of the major projects with the launchpad. That used UART, GPIO, systick and PWM timer interupts. Despite the lesser documentation and libraries found for this architecture (that use Stellarisware/tivaware) than competitors like ST Microelectronics, etc development board. This evaluation board is cheap (13 US Dollars) and decently fast which is ideal for newcomers for Arm and for hobbyists! Also you can try the easier way by using “Energia IDE” (based on Arduino project). It looks and works like arduino IDE! !